I met Chris Guthrie at the Fincon Expo and I’m really glad that we had a chance to hang out. Chris is well known for making 6 figures with the Amazon Associates program and he also runs a 6 figure business selling WordPress plugins called BoostWP.com. A lot of people believe that you have to know how to code in order to succeed in selling software. But not only is Chris not a technical guy, but he has found a way to get tens of thousands of websites to use his plugins. If you are interested in creating and selling WordPress plugins online, then this interview is a must listen. Enjoy! Do plugin reviews matter at all? Steve: Welcome to the My Wife Quit Her Job podcast. Today I have Chris Guthrie on the show. Now Chris is actually somebody who I’ve known about for quite some time now, but we finally got to meet face to face at FinCon several weeks ago. Now Chris runs a bunch of sites including an awesome entrepreneurship blog at entrepreneurboost.com where he openly talks about all his business exploits. But I actually brought him on the show today to talk about his WordPress plugin company boostwp.com. Now Chris is now the first entrepreneur that I’ve had on the show who creates WordPress plugins for his business. Now he is probably best known for his awesome plugin called EasyAzon, which allows people to easily insert Amazon affiliate links on their blogs. Now in the past I’ve actually thought about selling my own WordPress plugins as well. So I’m really interested in hearing about his story and with that welcome to the show Chris, really glad to have you on today. Chris: Thank you so much Steve, I would like to first say that that was a fantastic introduction, I felt quite pleased here. Steve: And incidentally I first heard about Chris– this is just for the listeners– he was one of the guys that generated a lot of buzz when he made six figures being an Amazon affiliate, and considering that you only get from 3-6% revenue off of that, that’s a pretty impressive fete. Steve: Yeah-yeah we’re here to talk about boostwp today. So give us a quick background story. Tell us about the business and how you got started with it, and then why specifically WordPress plugins. Chris: Yes so I think that the best way to probably get into it is to just talk about the first plugin that I did and basically you know you mentioned that I was doing Amazon affiliate things. That’s actually how I was able to leave my day job full time was when the Amazon came to pass that– well I got fired– that’s probably another conversation. Chris: Anyway that was five years ago and then I was making good money from Amazon’s affiliate program, and just kind of frustrated with the process of creating links, and you have to go to amazon.com click the link to this page button, the little grey bar at the top of your screen and you’ve got like text link and you’ve got grab the code put it back in your site and then you have a link right? Chris: And so this can just be done within WordPress. So while I’m writing I can just make the links there. And so I set out on a quest and a long journey– no it wasn’t long I guess I looked into trying to find out who I could hire to do that because I’m not a programmer. Chris: And so yeah, so I started that way. Steve: And then is EasyAzon that’s your most popular plugin? Chris: Yeah that’s probably the most popular one. It’s been around the longest and so we’ve invested the most time, money, and promotion and everyone kind of knows about it most than the others I guess. Steve: Okay and so you mentioned that you’re not a programmer or anything, so how did you find someone to develop this plugin with you? Chris: Yeah, so that’s actually a really common question that people have when it comes to software development if the person is not a software person. And so in my case I actually just went to a local WordPress meet up, and I basically just looked around and I was like who here develops WordPress plugins? Chris: And I just kind of introduced myself to people and I think I ended up the organizer, and this is almost several years ago now, but the organizer had known someone else, Nick Warnes is his name. And so I worked with him and basically went out to lunch and we talked about the project and it was great because I was based in Seattle at the time and so was he. Steve: So was this like an equal partnership or…? Chris: So this one actually I just paid him as a contract type thing. Chris: I mean it was the first time that I had sold a plugin before, and generally I don’t like to do partnership unless I know that I can provide a lot of value. Chris: That was the initial stage. Steve: And then you know how much did it cost to create this first plugin of yours? Chris: I believe it was $4000 or so. Steve: Okay, so that’s actually not too bad and you talked about the idea– you got the idea for this plugin because you were trying to do Amazon affiliate links and you wanted an easy way to do that. And I know now that in your shop you have a whole bunch of plugins. So what is actually your process for deciding which plugin idea to actually pursue? Steve: Let’s talk about your second best plugin for example, how did you get the idea for that? Chris: Yeah the second best one I’d say– let me think here probably I did a few different plugins that are related to Amazon, they were separate types of things. Chris: But those ones were going to be shifting into EasyAzon, so I’d probably say better links probably would be the second most popular. Chris: And that was one that we launched earlier this year. Steve: How did you how did you get the idea for that one? Chris: One that does a lot of things better than what the other ones do. So for example knowing how many clicks you get on your blog is nice for your blog post. But knowing actually where those clicks came from is kind of more important because then you can determine this one post on my blog is getting a lot of traffic and also driving a lot of clicks, but potentially affiliate clicks or clicks to some sales page and then you can see okay there is some– so you have that business intelligence to see what you might want to do. Steve: You’re talking about in terms of like the source whether they came from search or referring source or that sort of thing? Steve: That’s more tedious for sure. Steve: Yeah. Cool so you know when you went out to create this plugin, so did you kind of validate your idea with a small audience before you invested the cash, or did you just go for it? Chris: Lately the strategy has been to do an initial light version that we offer through wordpress.org and then the premium version that we sell through the site. And we’ve seen some chunks of sales through that, but typically it’s just better to just focus on signs of the growth than focusing on the free version I found. Steve: Okay. So is the free version kind of your way of validating the idea like how do you– pretend you just created this plugin, or you have an idea for a plugin, do you kind of run the idea by your audience or your list first, or do you kind of put out this free version, see if it gets traction, what’s the ordering of things? Chris: Typically I’ll talk with people to see if it’s something that they’d like, but a lot of times it’s just– sometimes I really think that I would like because it’s like annoying to me. Steve: Oh no-no-no I mean I mean just curious if you did that because you know it’s a big project right? Steve: If you’re going to put out some software. If you’re going to spend all this time creating and debugging and all that sort of thing you kind of want to know it’s going to sell, right? Chris: I already leveraged the blog because I was talking about Amazon affiliate marketing so often. Steve: Yeah-yeah-yeah you were known for being the Amazon affiliate guy, so EasyAzon was probably a pretty easy sell, right? Steve: So what is your– so not talking about EasyAzon you know EasyAzon aside, what is in general your strategy for getting people to actually just try your plugins. Now you mentioned you have a freemium model, is that right? Chris: So a few different ways with boostwp we’re young enough to where we’re still kind of playing with the model. Right now we have a subscription type service we offer all of the plugins that we develop and then we do new plugins each month. Chris: But most likely we’ll shift to yearly just because we found that people use those plugins– you kind of have to match similar to what the rest of the market place is doing in terms of how they’re pricing things. So I noticed that you know some– they’re just aren’t that many plugin companies doing it that way. Steve: Yeah I know adobe has a similar pricing search where you get access to all their tools by paying this monthly fee and that’s what you’re kind of doing, right? Chris: Yeah-yeah and then to go back to your question I don’t think I really answered it was how we get people to try. A lot of it is just kind of leveraging the established platform that from being out and doing this for so long. But then also to just contacting where there are other influential bloggers and just getting more people using our stuff. And the long term strategy for boostwp is still early is we’ll have a podcast and we already have a bunch of podcast episodes recorded just getting ready to launch that, and then also doing more content marketing and driving traffic to that way. Sort of be kind of more traditional marketing in the sense for that. Steve: Okay and so when you mention leveraging your existing network, this is like an audience that you build from– is this from entrepreneur boost or is this from a different blog? Steve: How did you get those yeah? Chris: Yeah primarily from that blog and also just meeting so many people that that run blogs because it’s kind of like there aren’t a ton of people that do it full time for a living. Chris: I’ve been on online businesses and so you kind of get to know what a lot of people want and so yeah so that’s primarily. Steve: Let’s talk about that a little bit, so where have you met a lot of these entrepreneurs? Chris: A lot of times I just reach out to people. I do try and go to events, for a while I hadn’t gone to any event like a couple of years and then we had kids and I thought “Hey I should try and go to some events.” And that’s where we met, but yeah I mean that’s where I would meet a lot of people because you know if you reach out to say a blogger that you respect or you think they’re doing something interesting, really in any niche I guess they’re always really busy, but if you can meet them at a conference that’s the time when you know they’re right in front of you and you can have a conversation typically. Steve: Okay, but if you’re like a nobody, let’s say how do you outreach to someone? Chris: And then come to them with the solution to the problem you know they have. I think that yeah something that doesn’t immediately self serving I suppose. Steve: I see, so I was just curious so like let’s say you have this plugin and you were trying to get me to use it for example, would you kind of start the conversation off like do you have a problem doing this and this? Or would you try to just start a conversation first? Chris: And here you go. Steve: So is your strategy also to– do you give away the plugins to the like the big names so then you can just say like this guy so and so– this big name uses the plugin? Chris: Yeah I can, I’ve done that in the past where I give it up, but then if I’m giving friends then I’ll say pay this pay me, I’ll say just pay because then I’ll say you are a paying customer. Chris: Yeah I mean I think it’s– the thing to it is if what you’re building doesn’t provide more value than what you’re charging for then you’re already going to kind of have an uphill battle as it is. And so I mean for EasyAzon for example it’s– I can pretty much tell people if you’re making money from amazons affiliate program you’re not using this then you’re making less money than you could be, and it’s a pretty easy argument to make especially since the cost isn’t too that at all. Steve: Okay and do you ever use any sort of paid advertising to advertise your plugins? Chris: I haven’t, but I hired a new team member earlier this year, well I only guess it was only months ago. I hired a part time and then put them on full time but that’s one of the things that he’ll be probably working on and then– but yeah I haven’t really done a lot with that. Steve: Okay just curious so mainly it’s just relying on kind of your own network and your own lists thus far and just word of mouth? Chris: Yeah and I mean the other thing too is because I’ve been doing different types of products and software type thing for so long, it’s– I don’t know maybe it’s almost laziness in a sense it sounds maybe lazy, but you know I’ve been able to just kind of say, here is this product and I know it’s a problem that you have because others I see complained about elsewhere, or I see it you know else in the market and here’s our solution that’s in my opinion better. And then because I can send an email to tens of thousands of people then it’s usually successful. Steve: Okay and then that list was just leveraged before you even started basically? Steve: Okay based on your Amazon affiliates success, right? Steve: It’s mainly just people you’ve gathered over time? Steve: Let’s talk about that freemium model a little bit here, was it always like that where you gave away something for free, and then charge for an extra feature? Chris: No I mean typically that’s actually more recently that we’ve been doing that more and just a sense of trying to get our plugins into more people WordPress installs. Steve: I know which plugin you’re talking about. Chris: Yeah so that’s kind of like one thing. The other– really it’s just it started with just the premium version, right? I mean for EasyAzon I was like I just paid this guy, I should say Nick– I just paid Nick you know four grand or so to do a first version. I’ve got to make some money back to pay for this thing and then it was just sewn to that so yeah. Steve: I’m just curious how has going to the freemium model– has that affected sales positively negatively or just kind of flat? Chris: I think it’s somewhat positive, I think it’s still in the point where we potentially just need more plugins and there are more people using them to really see a huge amount. I noticed most I have Google analytics tracking for a Google gold or whatever it is to track freemium driven sales for EasyAzon from wordpress.org and other types of spots the plugin is delivered and given for free. And I’ve seen a pretty good chunk of sale, I get a pretty steady stream of sales coming through, I actually wish I had the exact numbers in front of me so I can tell you I’m on this. Steve: No that’s okay we don’t need exact numbers. I’m Just curious though do you do anything let’s say someone signs up for the free version, what do you do? Do you do anything to kind of push them over to the premium version like do you have this email sequence or something that tries to convince? Steve: Okay and how does that work? Chris: Yeah so right now if you want to go to EasyAzon.com you would see that there is pro versions and also we’re using like a pop up plugins, so when people try to leave– not that it will stop them from leaving but it will just you know the pop up will appear and people can enter their email to download the free version. Chris: And then so the first email is just the delivery of the plugin and then I set up the sequence very long ago, so I can’t recall all what it is but yeah basically just send them down and talk about what people can do if they were to upgrade to pro etcetera. Steve: Okay and then at some point once that sequence expires you don’t bother them again right it’s…? Chris: We’re using Infusionsoft for boostwp and then I use Aweber for my– the initial business I started with. Chris: And so there’s a lot of nice things you can do with campaigns and everything in Infusionsoft, but there’s also like a matter of actually building them. Steve: Okay yeah-yeah of course. I was just curious also what percentage of your freemium customers– so number one I was just curious for my own knowledge, what percentage actually install the plugin, and then what percentage actually upgrade to the premium model? Chris: I don’t have those exact numbers here with me. Steve: That’s all right you know ball park or…? Chris: I’d say so the people that actually– that download it’s I don’t even– I don’t think I even have– because the problem this was the challenge I guess and this is probably something good to point out, is that because WordPress plugins are it’s like a distributed software model where you’re getting customers some software and they can go and install it. At least the current version right now we’re not using like a license tracking system to you know to do that. We’re going to do that in the fourth version that we release in November, but some customers really you know it’s not easy to do that and then also to WordPress has a lot of strict guidelines to what you can and can’t do with your plugins. Like you can’t really call back to your server to see where your plugins install that. Chris: So that’s actually a big challenge when you’re doing things with WordPress versus like building your own sass app for example. Chris: Then you kind of have to also play by the rules but then it’s also a matter of you know being able to leverage the fact that there is a market place of millions of bloggers that can potentially be downloading and trying out your free version and that’s also a value there too. Steve: Okay. Is this a WordPress rule just on the platform or is it just a rule to get listened on wordpress.org? Chris: WordPress.org they have specific rules about what you can and can’t do with plugins that are listed there. And there’s things like you can’t for example if you have a feature in a pro version you can’t list it and then grey out like a check box like they can’t click it type of thing. Chris: Other thing that I know that Nick knows and I know that we have to plan the playground–play by the rules in their playground I guess. Steve: Okay and so how important is it to actually get listed on wordpress.org in terms of sales? Chris: I don’t think it’s actually that important. I mean I think really honestly the only reason why we did that was to test to see you know if we could get start driving some sales through that and we have. And so it’s been valuable in that sense. But before that we hadn’t even done a free version. For version one and two it was only paid. And so I don’t think that you need– like if you listen to this and you think, I have an idea for WordPress plugin and I’m trying to decide you don’t have to go with the free version actually. You could just go with a premium version then just do a minimum version. I mean that’s because we are doing so many and we have so many different projects that we have planned out, and we are going to be hiring another developer in January. You know we have to kind of go with just the initial, here is the value over the general value the software can provide. And let’s just get to that as quickly as possible with the least amount of fluff. And then if people adopt it well then we could try and really invest even more time into it type of thing. Steve: Okay. So it’s kind of that MVP model so to speak? Chris: Yeah I completely believe that. I think that a lot of like programmer type entrepreneurs they’ll end up– this is just from my personal experience speaking with them. So it might sound like I’m bashing it but they’ll end up you know kind of getting into this feature creep mentality where they are like this thing you know uses really like and then they’ll never really launch something whereas my attitude is to just launch it as quickly– as soon as possible after you’ve made sure they aren’t any bugs and everything, but that’s kind of yeah that’s what I’d say. Steve: Okay. And then I was just curious do plugin reviews matter on WordPress.org? Like do you make an effort to gather reviews for your plugins? Chris: No, I haven’t really made much of an effort. I mean I wish I could say I have a WordPress.org plugin that has you know a million downloads, and I have all these amazing data to share. But I mean it is still you know I don’t– getting elsewhere [inaudible] [00:23:59] has only been a more recent thing. Steve: Okay. I mean you are doing well and that’s why I’m asking so I was just– it sounds like WordPress.org isn’t like a necessity per say. Like if you do you’re marking right on your own you should be fine. 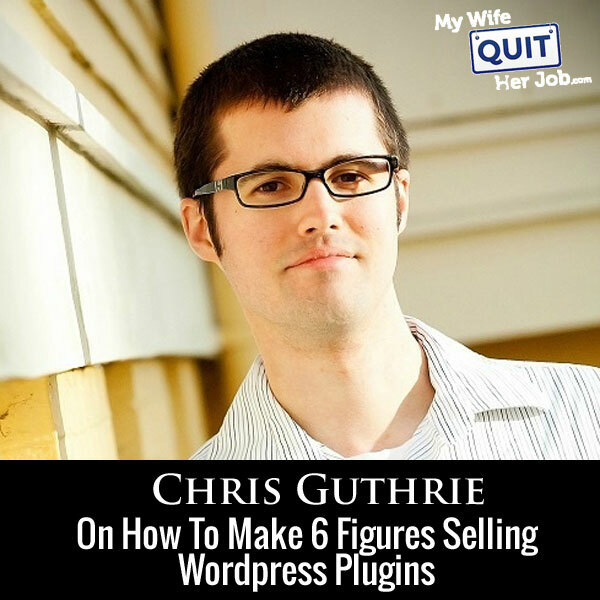 Chris: Yeah I mean there is a lot of six and seven figure plugins that well maybe not certain figures, but I know there is a lot of six figure earning plugins a year that don’t even have a free version at wordpress.org. Steve: Okay. And then I wanted to talk also and this is one of my fears of writing my own WordPress plugin. This is a technical product and most of the people you are dealing with are not technical. So how do you deal with support? Chris: Yeah so that’s actually a good question because you get a lot of it even if you make everything really clear. And then it’s actually shocking how many support requests you can get if something isn’t unclear and then you realize you have to go back and do something. So let me actually kind of go back and unpack that. Chris: So the way that I do the plugins is I create the help videos and I go through everything that’s covers the main kind of components of the plugin, and then try to make sure if there are any specific errors that people can get tripped up on for example. So EasyAzon has you have to get Amazon access key and an access secret key type thing from their system to access their API. Chris: So basically there is some problem that could happen there. So I think it kind of go like step by step through every single thing and actually show them on their screen where you doing to set everything up. So I’ll do video guides and then I have– because we sell multiple different plugins, I always put the videos in the same section. So it’s always just the end of the domain name and then just how hyphen to. Chris: So that’s like the first line of the defense it would be all the WordPress, all the videos, and then step by step videos you know I use Camtasia studio to record those, and I zoom into the screen and use the mouse cursor effect where you can highlight it. I have seen some people and I’m not sure why they would do this, but they don’t actually zoom into their screen when they are doing support. But then you don’t realize that people might be on like smaller browser or small resolution monitors or just they might not be able to see. Chris: So that’s like the first line, and the next would be support desk. And so we have four people in the support desk so that we can answer email tickets to them. So we use fresh desk right now. Chris: And then I like that one quite a bit actually I need to be moving over the other company to that system too. Chris: But yeah and so we just have some support reps that help there. Steve: You guys have a phone line? Chris: We don’t have a phone line at this time. No I think it would be difficult to do that because there are so many things that are so visual about you know doing it, it will become challenging. It might be cost prohibitive too. I guess thinking about the pricing. Steve: Do you do live chat then or it is just email? Chris: But then we have– another thing too is with the videos, that is one thing I should mention too is because I’ve sold plugins and I’ve also sold themes. So plugins are much different than themes in terms of support that you need to do, and that it’s a lot less. Steve: Okay plugins are a lot less support, okay. Steve: So it sounds like more of the story, do not develop themes. Chris: If you going to do themes and you are going to do like some type of life time license scenario, then I don’t know what to tell you other than good luck I guess you know. Steve: Let’s talk about that because you recently went over to this subscription based model. Before you were offering free support, right? Chris: Yeah I mean before it was pretty much a huge mistake to say, “Hey when you buy this plugin you can get life time updates.” But then sure enough I’m going to be living for hopefully quite some time and I hope that this business stays around for quite some time, and new features and new versions cost money. And I guess this goes back to I didn’t really know that much about this. And I didn’t really– I should have sought out people that were doing this to ask their advice before I did that because I think that that– and that’s actually a mistake that a few other friends have wanted to do plugins have made. I have tried to tell them to avoid making is to do like lifetime support updates. And I kind of compare to Bill Gates releasing their original windows version and saying lifetime updates. Can you imagine how ridiculous that would be? And had I thought of that really or had anyone said that to me then I would have avoided that costly mistake, because people– you are going to have people that really enjoy your software and they want to keep using it. And if you can have an annual type renewal where they can upgrade to get the new features then that’s really a way to kind of grow your business beyond just trying to find new customers. And I think that’s actually the biggest mistake I’ve made with this business model. Steve: Okay and then this institution based model is nice too, right? Because you get recurrent payments and that sort of thing and support isn’t as much of a problem at that point? Chris: Yeah I mean it’s pretty much yeah. Steve: Okay so I was curious also, do you have like a specific role out strategy to avoid like a sudden influx of bugs and complaints that you can’t handle? Chris: Yeah we do a lot a lot of internal testing and then we don’t have like a beta squad per say, like a group of customers that can test ahead of time. But that’s something that we are considering doing because– but again it comes back to partnering with someone that’s really good. Chris: Nick’s one of the best developers I’ve ever worked with. And that’s why I said, “Hey we should work together on this business and this is kind of the vision I have and I know that you can do it because you’ve done these other plugins.” And I think that definitely comes back to making sure you hire or work with someone rather that’s really good because otherwise you will end up with a lot of bugs. So typically we don’t get too many because his code is really solid. Steve: Okay and well tested probably. Steve: Okay and then you know and again this is a question mainly for my benefit sorry listeners. But you know WordPress gets updated like every several months, right? Steve: How the heck do you maintain the code for all the different versions? Is it just a constant updating battle? Chris: Well that’s a good question; I want to just go back to another example actually. So I used to do [inaudible] [00:30:54] forums. Chris: Years before this and that’s how I first started making money. And now you know you’d have these updates and then just stuff would break. And it was just like huge nightmare but that’s not really the case with WordPress. I have yet to actually have an update that WordPress goes to really cause some huge massive failure with the plugin. Chris: So that’s nice I guess you know because that’s a huge time circus to have to continuously change things just because WordPress is being updated. Steve: Okay so that implies that WordPress is a very robust sort of upgrade policy so to speak. Steve: Okay, right crushing with themes and that sort of thing. Steve: And I had a couple of questions on just pricing. So how do you kind of determine pricing for your plugin and then how does support cost kind of factor into that pricing? Chris: Yeah so I typically just– so when I first started I priced EasyAzon at $47. Chris: I think I might have done like an initial discount pricing for a time limited period, which I would suggest doing because scarcity in the marketing is really powerful and especially if it’s real scarcity. So obviously you want to increase the price if you say you are going to. But yeah so that was the initial price that I went at. And I just kind of looked at what competitors were doing to see what they were charging. And so yeah typically it’s just I’ve looked to see what other are charging and then where I started out before worked well. Chris: And I’ve done some price increases and tests to see you know if there is any discounts not discounts to any drops off in sales, but– and then through gorgeous support. So typically right now you know we get a lot of support requests, but the revenue regenerates much-much higher than the support amount that we pay. Chris: And then also I do some support, but it’s only stuff I guess past initial few people. Chris: So it’s not using too much of my time either. So it’s really not a huge amount of it. And I think it goes about to the earlier point I was saying about with WordPress themes you’ve got a lot of different things that can– and I don’t know maybe there is someone out there listening and saying, hey you had a really bad theme developer or something that I don’t know. Steve: I’ll try to get someone who develops themes on the show Nick. Chris: Yeah that would be good. And I’ve only done a few themes and so I only know from that. If he explains then I don’t want to do them. At least for now until we have more team ever seem– make it viable but yeah. Steve: Okay. And you know, what are some of the biggest challenges that you’ve kind of come across in developing plugins? Chris: I think that the biggest is that anytime you have an idea for what it is you want to accomplish through a plugin or whatever product it might be, it’s just always going to take longer than you expect it will. I think that’s something that I hear people always say and then you think as a listener you might be thinking that you know that’s not the case. But that’s always case. There is always like features that’s slowly creep in that you just have to have, and that’s the challenge to kind of bail again. So I think it’s just a matter of making sure you plan appropriately and then additionally because we try to be prolific with the amount of software that we release. I think the key thing too is to make sure you set deadlines up. So it’s kind of I guess a battle all right between those two. Chris: But when we set a specific deadline we also use we also have affiliates to help sell our plugins. And if we set a deadline there are a date that we are going to launch on, then we have to make sure we hit that date so that’s the right way they can kind of help make sure we get on track. Steve: Okay and then about what were we just talking about Chris sorry. Steve: No there was a specific challenge that I was just going to ask you about but I can’t remember. Okay so if I wanted to create a WordPress plugin today, what would be like your key piece of advice? Chris: Key piece of advice would be to just look at what the minimum version you can do. Chris: That you can then charge for. And if you have enough capital that actually support then maybe you could do it for free initially, but I mean if you are using like donations or something like that that try and make money then I’m laughing while I’m talking because this is not going to work. Chris: Because I’ve talked to some other developers that have those and they say, “I think I’ve got a donation once a few years ago.” You have to charge to prove your value. People really value things based on what they pay for them. Steve: I remember my question now, when you are in the design portion, the design face of your plug in, do you use any sort of software or tools to help you kind of plan out how you want the plugging to look and function? Chris: So initially I would you know I did like some mark ups just– I can’t remember if I used pen and paper enough, but I did use pen and paper for another project that I’m doing with a different– for assess thing that we are building. But yeah I just use for that one actually sheets of paper and [inaudible] [00:36:27] just sitted on a flight while I was going actually to FinCon. Chris: Yeah so I just as I marked it up and then I handed it up to developers. Yeah so I typically would just use that. I don’t use anything like balsamic or any of those wire framing tools. But I think that comes back to you as well that I have worked with Nick for several years now versus when I hired him as a contractor and then now that we are business partners. And it’s kind of like he is really good at UI and kind of understanding how like what the best flow would be. And then after he gets initial version to me I can kind of okay I think we should change this around because of this reason, right? And also too with WordPress at least the way that we design plugins we try not to actually make the UIB you know look a lot different than what you experience already in WordPress. So we will re-use a lot of the assets in there. So like if you’d go and you click the EasyAzon button in your WordPress post editor, it pops up the window that looks like the media window where you want to upload images. Chris: So it’s similar in that way. Steve: Okay. All right and then just in terms of understanding the mechanics of how to create a WordPress plugin, did you guys learn from any books? Like can you recommend any books on it? Chris: I don’t know any books because I have never– I don’t know I’ve never written the line of code in a WordPress plugin before. Steve: Okay, but even just the process is there– like how did you guys learn? Or is it Nick or? Chris: Yeah Nick who knows maybe he could be a good guest for you but yeah he started freelancing and all other stuff yeah but he– I think that he just kind of learns because you know it was something that he could do, and then he had clients asking for it and so started doing that. But I don’t know I’d have to follow up with Nick to see exactly what he did. Steve: Okay and what about just marketing in general? Where did you get your jobs, is it all experience or did you read any books as well that influenced you? Chris: And just lots of trying to make sure that you just take action. I think that a lot of people would talk about the things that they want to do, like for example I have friends that say, “Oh it’s cool you make money online and you have these online businesses and you work from home and all that.” And then it seems like they are interested in actually learning more and I start to get such ruin in my mouse. My mouse starts to run on my own minute and then they ask all these questions and then they never do or say anything. So I think it’s just a matter of you know say or listen to this podcasts right now. I said this on another one– another podcasts and I was like don’t become an expert at listening to podcasts. You’ve got to be able to take what you learn from whatever it is and then actually do something. Steve: Are you trying to get my listeners to stop listening to my podcast Chris, is that what is going on here? Chris: I’m just saying they can listen to your podcast within as long as they get home say they listen to it on their drive to work, and then you know they can get on and actually do something. That’s all I’m saying. Steve: And just curious how long you know after you released your first plugin did it actually gain traction to make sales? Was it pretty immediate or? Steve: Let me ask you this, if you had no platform what would you have done? Steve: Yeah I mean I ask you that for a reason because I think establishing some sort of platform before you do anything is very important. That way you always have an initial set of customers to sell to right when you launch, right? Chris: Yeah I wish I knew the name of the company. It’s either like Unbounce or someone else. But I hope it’s not them because that might be their competitor but it was– one of their co-founders who have been writing blog posts for months and months about conversion rates type stuff. And when they release their tool they had always people that have been reading and they had you know they’ve been building their email list and all that to help. So I really think that you know pre-launch you know getting a pre-launch list and that actually launching something is really important. And making in an advance and trying to really push it. Steve: Yes so Chris we’ve already been chatting for about 40 minutes. If anyone has any questions for you just about your plugins or just writing a plugin in general, where can they find you? Chris: Yeah so the best place to find me would probably just through my blog entrepreneurboost.com and I’ll say slash Steve, so I can know where you came from, and I’ll set up a page that says you know includes my contact and so just some of the other random projects that I’ve been doing over the last few years. Not only saying random because it’s just I’ve done a lot of different things. Some of them have taken off and then others have you know not been as good enough, but I still learnt from them. Steve: Okay yeah and Chris has got a great blog you guys should all go check it out on entrepreneurboost.com. It talks about some really cools stuff and he often mentions numbers to back it up as well. So it’s pretty cool. Chris: Yeah, yeah that’s what I like to do. Steve: All right Chris hey thanks a lot for coming on the show man. I really appreciate your time. Hope you enjoyed that interview. Chris is awesome, and what I find interesting about his story is that he discovered a problem while running his own WordPress site and decided to develop a solution to his own problem. Plus he is not a programmer which just goes to show that you don’t really need to have a technical background to do software development. For more information about this episode go to mywifequitherjob.com/episode53, and if you enjoyed this episode please go to ITunes and leave me a review. When you write me a review it not only makes me feel proud, but it helps to keep this podcast up in the ranks so other people can use this information, find the show very easily and get awesome business advice from my guest. It’s also the best way to support the show and please tell your friends because the greatest compliment that you can give me is to provide a referral either to someone else or to share it on the web. “BuddyPress is one of the best plugins that I’ve worked with. It has helped me gather visitor opinions and get ideas for improvement, without me having to run tiresome surveys, or create polls or send out emails to all of my subscribers.